Difference between revisions of "Chariton County (Missouri, USA)"
'']] Chariton County, [[Missouri (USA)|Missouri]] was the location of a Mennonite ([[Mennonite Church (MC)|Mennonite Church]]) settlement north of Brunswick, now extinct, to which Mennonites first moved in 1869. When [[Coffman, John S. (1848-1899)|J. S. Coffman]] held meetings there in 1890 he reported a membership of five, which included the families of J. L. Kreider and Fred Brunk. Earlier Beachtels and Overholts had lived in the community. Chariton County, Missouri was the location of a Mennonite (Mennonite Church) settlement north of Brunswick, now extinct, to which Mennonites first moved in 1869. When J. S. Coffman held meetings there in 1890 he reported a membership of five, which included the families of J. L. Kreider and Fred Brunk. Earlier Beachtels and Overholts had lived in the community. Gingerich, Melvin. "Chariton County (Missouri, USA)." Global Anabaptist Mennonite Encyclopedia Online. 1953. Web. 25 Apr 2019. http://gameo.org/index.php?title=Chariton_County_(Missouri,_USA)&oldid=86645. Gingerich, Melvin. (1953). Chariton County (Missouri, USA). Global Anabaptist Mennonite Encyclopedia Online. 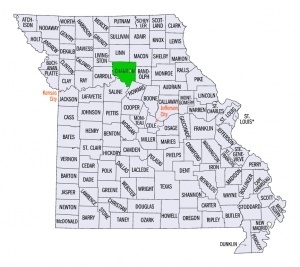 Retrieved 25 April 2019, from http://gameo.org/index.php?title=Chariton_County_(Missouri,_USA)&oldid=86645. Adapted by permission of Herald Press, Harrisonburg, Virginia, from Mennonite Encyclopedia, Vol. 1, pp. 548-549. All rights reserved.